A nursery school worker has been taken to hospital with a "slash wound" after reports of a stabbing in east London, police have said. 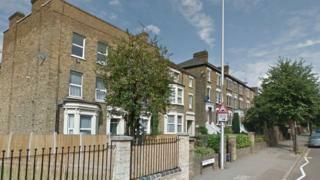 The victim, who is in her 30s, was attacked in Hermon Hill, Wanstead, on her way to work at about 09:30 BST. Nursery manager Karrien Stevens said the woman told her she was slashed by three Asian women dressed in black. Counter-terrorism police have been informed but are not treating it as a terrorist incident. Ms Stevens, who runs Little Diamonds nursery in Hermon Hill, said the woman told her that she was attacked while on her way to work from Wanstead High Street. The attackers slashed her arm from the wrist upwards before running off down the street, she said, and shouted out "something to do with Allah and the Koran". The victim's injuries are not life threatening but she was taken to an east London hospital as a precaution, the Metropolitan Police said. In a statement, the force added: "The suspects fled the scene prior to police arrival in an unknown direction. "No arrests have been made. Enquiries continue. "The Met's Counter Terrorism Command has been made aware of the incident but is not investigating at this time."